Google Chrome ships with an automatic updates module that checks for, downloads and installs updates whenever they become available. This is different from Chromium which does not ship with this functionality. While it is usually recommended to keep the updating feature enabled, mostly for security reasons, you sometimes may need to disable the automatic updates, for instance when Chrome is deployed in a company network or if you want to thoroughly test updates before they are installed on live systems. While you can disable GoogleUpdate.exe in the Windows Task Scheduler, it does not really help you that much as Google seems to add new tasks automatically when you are running the software. Google provides Windows system administrators and users with a Group Policy template that they can install on their systems. This template can be used, among many other things, to disable automatic updates of the web browser in Windows. Note: The Group Policy is not available in all versions of Windows. Download the ADM template for configuring Google Update (auto-updates) from the Chromium Projects website and save it to your local system. Tap on the Windows-key once you are done, type gpedit.msc and hit enter. This should open the Local Group Policy Editor. 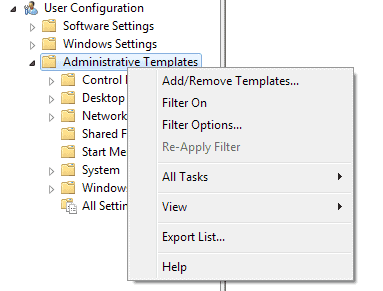 Browse to Computer Configuration > Administrative Templates. Click on the add button when the new window opens up after you have made the selection. Select the GoogleUpdate.adm template that you have downloaded previously to your system. Click the close button to go back to the main window of the Group Policy Editor. Open the Applications folder under Google Update. Locate Google Chrome here and open the folder as well. 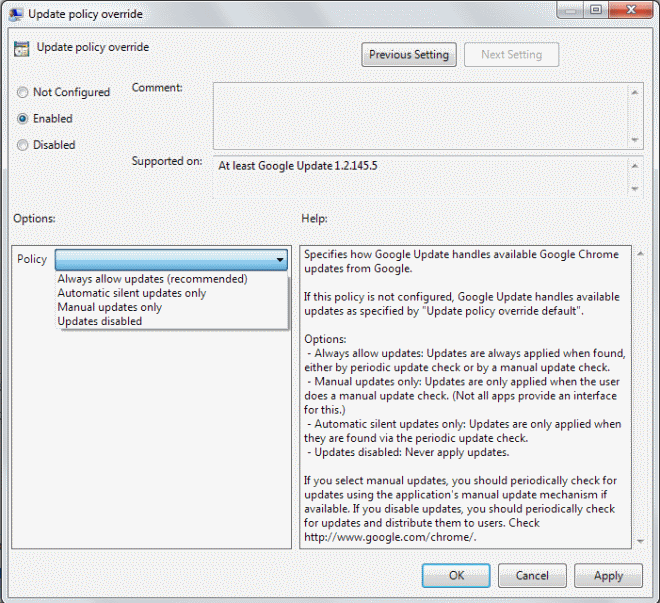 Here you find Update policy override which is by default not configured. Always allow updates (recommended) - This is basically the default setting. If you select this one, Chrome will check for and install updates automatically, and also install updates when the manual update chekcer is used. Automatic silent updates only - Updates are only installed if found via the automatic update checker. Manual updates only - Updates are only installed when found via the manual update option in the browser. Updates disabled - Turns off all updates, manual and automatic. Note: Depending on user rights, users may still be able to install a new version of Google Chrome manually by downloading the installer from the official website and running it on the system. Picture is taken from User configuration and the written text tells to go computer configuration.